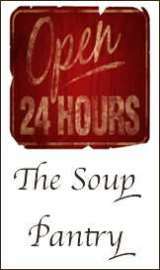 A Simple Crockpot Potato Soup Recipe. This favorite from our slow cooker soup recipes archive yields a rustic soup that can be adjusted to suit your tastes and diet restrictions. 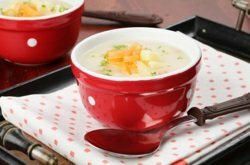 Come home to a steaming and fragrant soup on a cold or rainy day, just add a little cream on your way in the door, change into your relaxing duds and let this soup give you a big warm hug from the inside out. You can even add cooked and crumbled bacon or scramble fried hot Italian sausage to the crock pot with the cream for the last hour, for a substantial meat and potatoes dish. Place the potatoes, carrot, onion, garlic, celery, dill, parsley and chicken stock (or bouillon and water to make 5 cups) into the crock pot. For a thicker and creamier version, gently crush some of the potatoes with a potato masher. Add milk or cream and adjust seasonings to suit your taste or diet, heat for another hour. A leek makes a great substitute for the onion and a cup of (fresh or frozen) corn kernels can be added for color and flavour.